The plant is a historic step for negative emissions technology – earmarked by the Paris climate agreement as being vital in the quest to limit a global temperature rise of 2°C. Founded by engineers, Christoph Gebald and Jan Wurzbacher, Climeworks developed its technology to capture atmospheric carbon with a filter, using mainly low-grade heat as an energy source. In Hinwil, Switzerland, the DAC plant has been installed on the roof of a waste recovery facility – operated by the municipal administration union KEZO – with its waste heat powering the Climeworks DAC plant. During the Climeworks capture process, CO2 is chemically deposited on the filter surface. Once the filter is saturated, the CO2 is then isolated at a temperature of about 100°C. The pure captured CO2 gas can then be sold to customers in key markets, including: commercial agriculture, food and beverage industries, the energy sector and the automotive industry. In Hinwil, Climeworks provides a continuous supply of CO2 through an underground pipeline to a greenhouse 400m away, operated by Gebrüder Meier Primanatura, to assist with growing vegetables such as tomatoes and cucumbers. 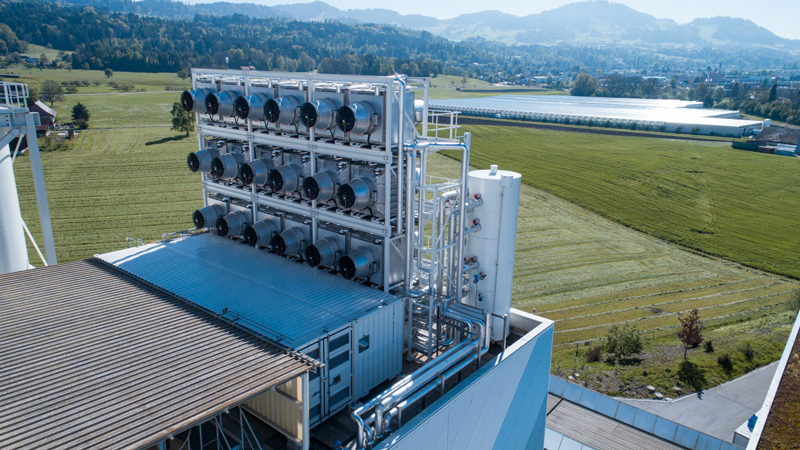 By securing this supply agreement, Climeworks has ensured the Hinwil operation is the world’s first direct air capture plant with a commercial customer – an important step for the future of negative emissions technologies. The Hinwil plant will operate as a three-year demonstration project in co-operation with the partners Gebrüder Meier and KEZO, and with a contribution towards non-amortisable costs by the Swiss Federal Office of Energy (SFOE). The CO2 captured by Climeworks can be used to carbonate beverages or produce climateneutral fuels and other materials. Capturing CO2 locally for industrial uses enables customers to reduce their emissions and lessen their dependence on fossil fuels, as currently most industrial CO2 is transported from fossil point sources via truck to industries on site. In comparison to other carbon capture technologies, a modular Climeworks plant can be employed almost anywhere. In coming months Climeworks plans to launch additional commercial pilot projects in key target markets and wants to test its technology’s potential to deliver negative emissions by combining it with underground storage. “With the energy and economic data from the plant we can make reliable calculations for other, larger projects and draw on the practical experience we have gained,” said Jan Wurzbacher, Climeworks Co-founder and Managing Director.